I’ve been working on listing (and often RElisting) items in the shop lately. The holidays were so busy that I didn’t have time to make stock, only work on orders. For example, this lovely duo. 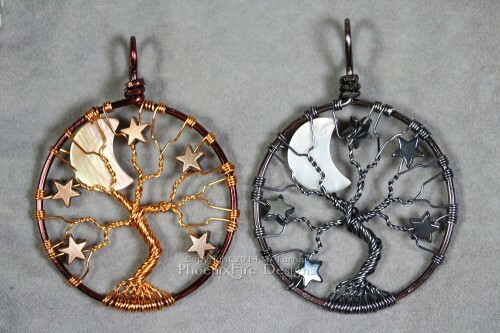 The gunmetal crescent moon and stars tree of life has long been a favorite in my shop. But I also made a NEW version in mixed metals of brown and copper with copper stars. I think it gives it a steampunk vibe. Steampunk inspired brown and copper tree of life pendant with crescent moon and stars and gunmetal tree of life with crescent moon and hematite stars. Additionally, there’s another Full Blue Moon Tree of Life Pendant in fire crack agate and handmade in gunmetal wire once again available again too. 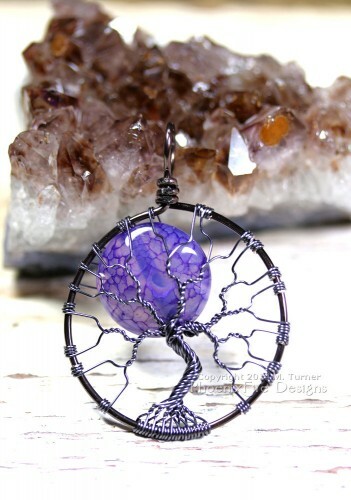 Blue Moon Fire Crack Agate Tree of Life Pendant on etsy by PhoenixFire Designs. Of course, there’s always pendants like my Opalite Moonstone Owl Tree of Life Pendant available as well. 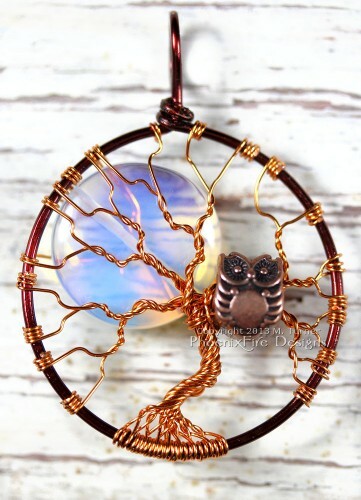 With copper wire and a wise, copper owl sitting up in the branches in the tree under a full moon, this is another lovely night sky inspired piece of handmade jewelry. Opalite Moonstone Full Moon Tree of Life with Owl by PhoenixFire Designs on etsy. So that’s just a peek at what I’ve been working on. As always, there are plenty more available in the PhoenixFire Designs etsy shop and I’m always happy to customize. Since each piece of PhoenixFire Designs jewelry is handcrafted by hand from scratch, I can always make it unique and personalized. Just drop me a message on etsy with what you have in mind!